Luxurious Cedar Vacation Lodge in the beautiful Black Hills. The Cedar lodge sits on 4 acres of land, and has a running stream running right by your home, with catch and release trout in the pond in your yard. Games such as horse shoes, crochet, and a bean bag game are provided for your enjoyment. Relax on the deck and be amazed at the magnificent scenic views. The home has 5 bedrooms, each with a queen size bed. There are 3 full bathrooms, fireplace, foosball table, jet spray tub, and an outdoor hot tub. The Cedar Home is fully furnished with all the comforts of home. The large deck has a roof overhead, so you can enjoy the deck in any time of weather. National Forestland is right out your back door, with trails for snowmobiling or 4-wheeling or hiking. Deer, wild turkeys, and chipmunks are abundant! The Cedar Home is the perfect place to get together with family and friends, enjoy quiet privacy, the mountains, the night sky and stars, and the smell of pine! Snowmobile or 4-wheel right from your yard! 15 min. from Deadwood, and near many attractions such as Mount Rushmore, lakes, fishing, several golf courses, skiing, snowmobiling, biking, hiking and more. The Cedar house is modern, spacious, and completely furnished for your comfort. We built the Cedar Home in 1995, with the vacationer in mind. We have 2 homes in the Black Hills that we rent, and have gained a strong base of repeat customers that we call friends. The Cedar Home sits on 4 acres of land. It has a pond right out front, with trout for catch and release. The views of the Black Hills are breathtaking. Most every early am and at dusk, you will see deer come down from the forest,or wild turkeys right in your yard. It is quiet and peaceful, yet close to attractions and historic towns. Beautiful views of the mountains! The home is right up against National Forestland, with trails for hiking or 4-wheeling. You can't ski in, but you can ride your sleds right from your home, no need to trailer them! fully furnished with dinnerware, pots and pans, electric fry pan, coffee maker, crockpot, toaster and linens. Stools at counter as well. Terry Peak is 15 minutes away. Snowmobile right from your home. We came here for a snowmobiling trip. The snow was great and we were able to ride the sleds right off the property and jump on the trails about a half a mile from the cabin. There were enough beds for everyone to have their own place, the kitchen was well stocked, everything worked, nothing was amiss! We did have a enclosed 4 place snowmobile trailer that proved to be a challenge, but that may have been because of all the snow, which was just freshly plowed just before we got there. These people thought of everything to make our stay comfortable. If there had not been enough snow to ride out, Recreational Springs is a 5 minute drive away, and Trailshead is about 20 minutes. The location of this cabin is beautiful, feel like you are on your own slice of heaven. We will most definitely look at booking this again the next time we come out. Loved everything about the house and the lot. A little bit to far from Mt Rushmore and keystone in our opinion because of all the roadwork. Great place to stay, WiFi would be nice as cell service is horrible there. Warren H.Where do you live? The Cedar House was rented by us and our 14 children, grandchildren, and spouses. It was perfect place for all ages! We had plenty of room for everyone to sleep. We did bring 2 blowup mattresses which one was put in the loft for kids to sleep. The house was roomy and perfectly laid out for all to have their own space. We were close to many activities but also had much to do at Cedar House. The hot tub, decks, wild life, fishing and beautiful scenery was awesome to just sit and relax morning or evening. Thanks for Cathy for visiting with us and answering all of our questions and for sharing your beautiful house. Our 45th anniversary will always be remembered in your beautiful state. We hosted a family reunion at the Cedar House. Family came from Arizona, Indiana, Colorado and Nevada, along with South Dakota. We had an amazing time together. I was able to cook meals that we enjoyed together. All the pots and pans, dishes were there- even a mixer! Plenty of activities to do in the area for day trips, but my favorite was the peace of the Black Hills. We visited, shared stories and laughter in every room of the house! I loved sitting on the deck watching the wild life, and hiking in the quietness of the Hills. The children had fun...we found a frog, chipmunks, a snake and so many beautiful rocks. Our 5 year old grandson said, "Is this Grandma's party house?" We played games on the lawn, and enjoyed the hot tub. People of all ages from 70 to 2 years of age had a great time. We will go back again! A little over two years ago, my family was looking for a house to rent in the Black Hills. We were coming up on a year since my father had passed away, and needed a place to get away for the weekend. We needed a house that was big enough for all 12 of us, and we wanted a house that didn't have neighbors right next door. We found exactly what we were looking for and more with the Cedar Home! The views are absolutely beautiful and the front yard is large enough for the kids to run and explore. We spend a large part of our trip playing yard games, grilling, and hiking. Every year we leave the Cedar Home with memories that will last us a lifetime. Thank you Cathy, you have been a pleasure to work with! We look forward to our stay next year! GREAT VACATION HOME! WE KEEP COMING BACK YEAR AFTER YEAR! We have been staying at the Cedar House for the last 4 or 5 years. We enjoy staying here because it is quiet, beautiful, and meets our needs for the 5 couples that stay there. 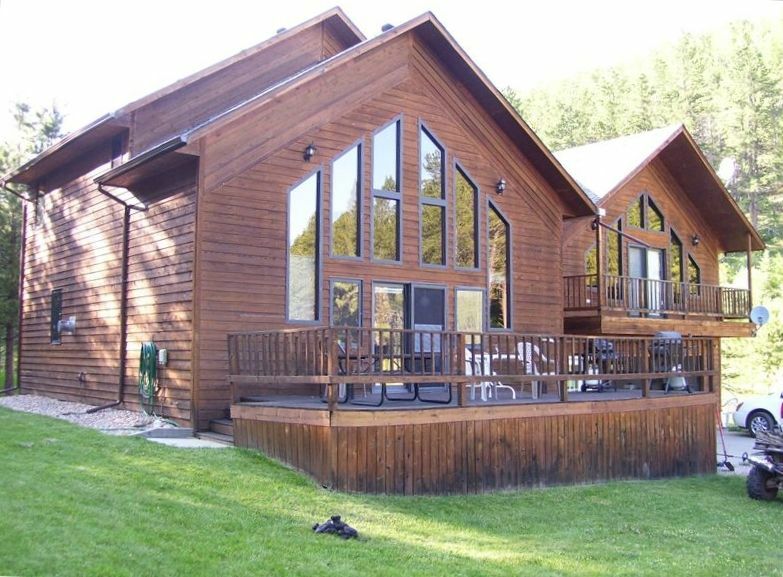 It is close to Lead-Deadwood, easy access for 4-wheeling, great for hiking or walking, or just cool to sit in the hot-tub enjoying the scenery and outdoor life animals. It is so cool to go to sleep at night with the windows open, smelling the beautiful pine and hearing the water trickling down the stream. We enjoy being able to cook if we so desire, which we seem to do a lot of, instead of dining out. Every year there has been an upgrade to the property. It has always been clean and well taken care of. At the end of our stay, I never have to ask who is coming back with us for the next year, we just have to tell other friends, sorry, there has been no cancellation. Don and Cathy are very good at accommodating our needs, which is very appreciated. That is one of the reasons we keep coming back. It is a great vacation spot. The Cedar Home is in a quiet draw, right up against the National Forest. Lead is 10 minutes away for all your grocery, dining, or drug store needs. It also has several bars and coffee shops, as well as a mining museum. Deadwood is 15 minutes away, with many options for gaming, tours, bars, dining or shopping. Sturgis Bike Week rate is $4900.00 for the week, plus tax and cleaning fee.